This is a pair of universal simple one-piece owl patterns. 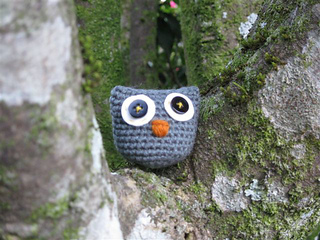 Using the yarn of your choice, owls are stitched with a needle or hook 2 sizes smaller than the yarn normally calls for. For example, I used worsted weight yarn and a size F hook for the brown owl and the same weight yarn and size 6 (4.0 mm) dpns for the gray one. Both owls share the same finishing instructions and are done in the round from the bottom up. • Toy stuffing to fill owl AND a small bag of rice, beans, or poly-pellets to weight the bottom.